Yesterday I blogged about girls basketball and role models. Today I'm going to blog about football coaches and leaders. I guess I've got sports on my brain this weekend (for good reason). 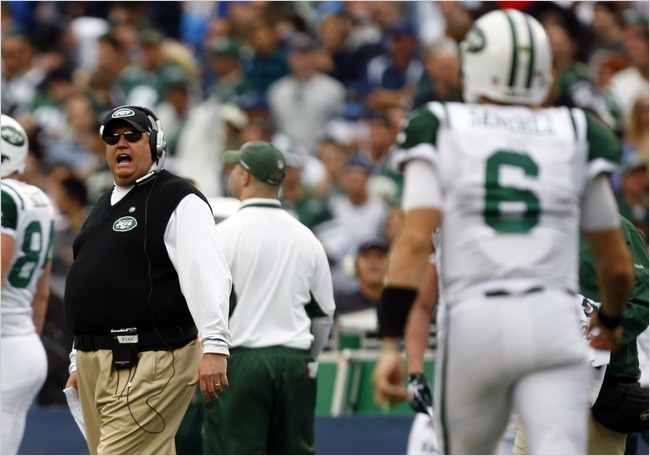 In Ryan’s first season as coach, he changed the Jets’ second-class existence through the sheer force of his bold and brash personality. He spoke loudly and often about the talent that surrounded him, until the players believed every word he said. Ryan turned one of the N.F.L.’s most clandestine operations in into an open book. The Jets collapsed at the end of 2008 in part because of the tense atmosphere. Ryan changed that, changed a culture, changed the way people felt about coming to work. Companies are reflections of the people who lead them. Same with football teams. I've watched almost every Jet game this season and last season. The difference in the team is so visible. They play with a brash and bold style this year that was not on display in the Mangini era. But it's the last line of the second quote that is the biggest deal, he "changed the way people felt about coming to work." That's what great CEOs do. They inspire people to come to work with a bounce in their step and a desire to do great work. And that is largely about people skills. We all know people who have the special touch with people. They make people laugh, smile, and feel good. Those people make great CEOs, leaders, and football coaches. Instead of operating from a tower like a dictator, Ryan walks the hallways, massaging egos, cooking up defensive plans. We'll see how well Rex Ryan and the Jets do today against the Colts. They are big underdogs and rightly so. I'll be rooting hard for them and I'm sure the Jets will give it all today. But win or lose, Rex Ryan has impressed me very much in his rookie season. I look forward to watching him work the sidelines of Jets games for many years to come.